Jenni and I go way back... well, back to about 1.5 years ago when she first emailed me to inquire about designing invitations for her Fall 2016 wedding. She found my Farmer's Market invitation suite on Pinterest and hired me to customize it for her big day. After working with her for several months and wrapping up all of the wedding stationery, she approached me about their next big adventure involving her, her husband Jim, and his brother Matt: branding for their family-owned farm. Jenni and Jim are newlyweds living in the beautiful Wisconsin countryside. Jenni is a crop insurance associate, and Jim and his brother Matt are fourth generation auctioneers and real estate agents, specializing in rural and farm properties. So, if anyone knows about farming, agriculture, and working the land, it's these guys. Their love for agriculture, crops, animals, and their community runs deep, so putting more time and love into Gavin Farms is just an extension of who they are and what they are passionate about. And these Gavins are smart business owners who know that really good branding would be an essential part in helping their farm flourish. From the moment of our initial conversation about their mission, personal style, passion for agriculture, short-term and long-term plans for the farm, and the impact they desire to have in their community, I was stoked to be able to brand a business that I am completely on board with and would personally support if I lived in their community. I have genuinely loved this whole process and am so happy they now have a beautiful visual identity and brand strategy to help them start strong and really shine as the established, stand-out folks that they are. Jim and Jenni, you guys are awesome! Thank you for entrusting me with your branding and the JOY it has been working with you two. I am excited to see Gavin Farms grow and the impact you guys will make on your community! If you want to follow along with Gavin Farms' adventures in farming, cattle-raising, chicken-wrangling, veggie-growing adventures, find them on Instagram here. Be prepared for some seriously beautiful inspiration (and possibly the sudden desire to move to Wisconsin asap). In this post, I want to dive into the brains behind the branding and show you more of my process that involves not only nicely crafted final logos, but also an entire branding strategy I put together for them that includes our project goals, a mission statement, target market identification, mood board, final collateral, and more. Keep scrolling to read about my process. 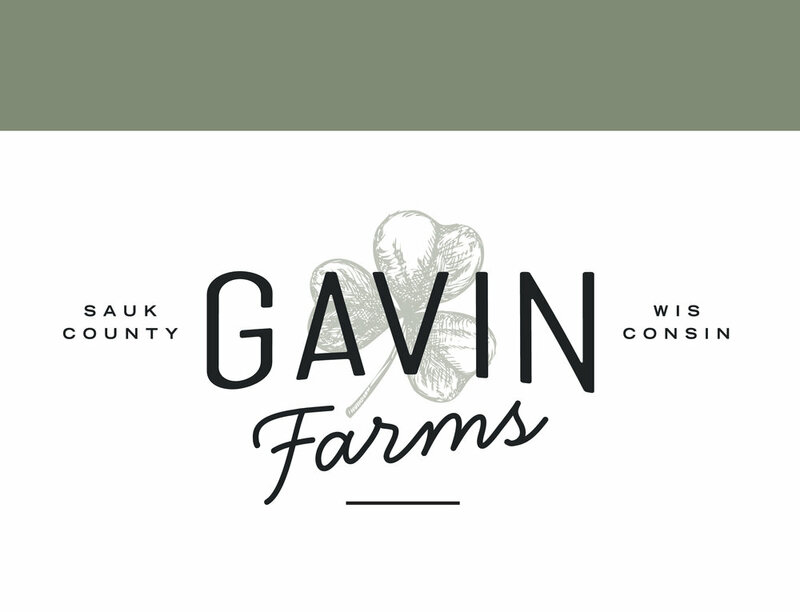 The ultimate goal was to develop a strong logo collection and brand elements that represent Gavin Farms as an established, trustworthy family business and that visually communicates their mission to provide quality, fresh, locally-raised products to their immediate community. Gavin Farms has a unique opportunity to be an influential, stand-out force in their town, and we needed to create a brand identity that grounds them as reputable, trustworthy, and a much needed resource for the community. Part of the branding strategy was to establish a list of keywords and phrases with Jenni and Jim. This, along with the visual mood board, helps me stay focused on the goal and helps keep every design element in line with the overall vision. Based on this content, I was able to develop a list of possible design elements and color combinations. Some initial design elements I knew I wanted to explore were: hints of vintage lettering, sans serif/hand-written font combo, clean/monoline shamrock OR hand-drawn/etched shamrock (the Gavins are Irish, so including this symbol was a must! ), circular stamp-like layout, neutral palette + muted green. The imagery for the mood board is not just a bunch of pretty pictures. 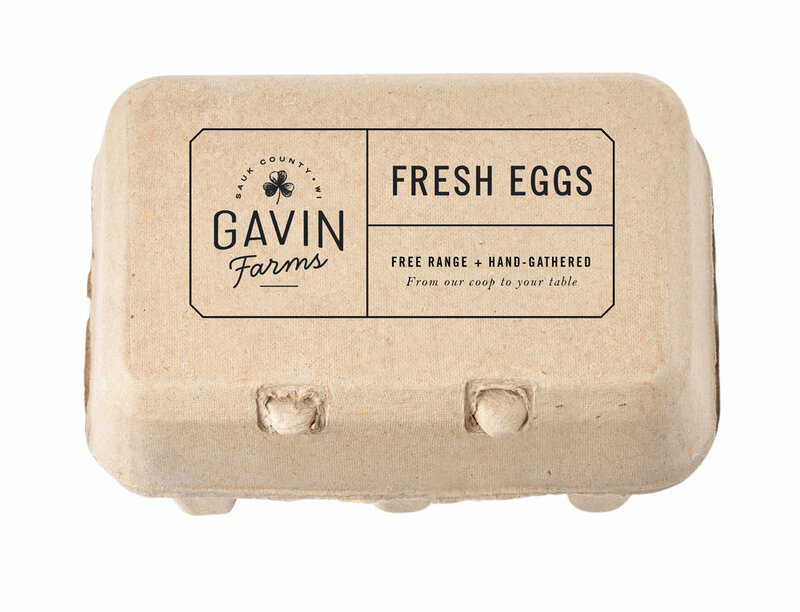 I carefully curated each image to reflect an aspect of Gavin Farms' vision and communicate a brand look and feel that not only represents it's essence but also appeals to it's target market. You'll notice many hands interacting with animals, land, and food, representing GF's care and integrity; An emphasis on the earth and the ground, representing real, natural food sources; Work boots and hands holding soil, communicating that GF is about real people growing real food; and of course, explorations of type and layout that will tie everything together in a beautiful logo identity. Gavin Farms' customers are individuals who put high value on the quality of their food, knowing their food sources, eating clean, and living active, healthy lifestyles. They most likely represent a post-college young adult generation (20s-30s) as well as a more grounded, middle-aged generation, approximately ages 40-55, all of whom live in Sauk County and are passionate about having relationships with and supporting local farmers and businesses. They enjoy the outdoors, farmers' markets, adventure, investing in their community, and simple living. Cheers to Jim, Jenni, and Matt! (and go give them some love, guys). Note: All imagery on the Mood Board was sourced from Pinterest and Stock photo websites, and I do not claim ownership of any of them, nor do I intend to use them for commercial purposes. They simply serve on the Mood Board as inspiration images for the project, much like a Pinterest board would be used in curating images for project ideas.